The EPION Metabolic Monitoring working group has adapted a guide developed by service users and practitioners from Greater Manchester Mental Health NHS Foundation Trust in England. This guide was developed to empower service users to improve the quality of the care they receive. 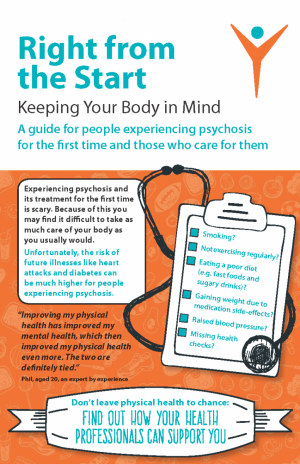 This guide highlights the importance of asking health professionals about your overall health, not just your psychosis. It provides four easy steps to make a difference right from the start! Check it out the guide. Hard copies and pocket-sized versions will be available at the May 2018 EPION network meeting. Copies can also be requested by contacting info [at] epion [dot] ca. This evidence brief outlines the available evidence on specific mental health promotion interventions delivered in the early years focusing on the zero to six age range.